I smiled when I read the part of your letter telling what the boys gave you for your birthday, & how Andy wore one to school. Guess you aren't an "old fogey". I'm glad you liked the shirt & sweater. I didn't think you were conservative in your shirts. If you are, what is Dale, who doesn't go in for bright colors. I like the shirts they sell today. I called Rose this past week & found out that Rick asked Karen for a divorce, after 21 years. She said Karen wants to move to Toronto. Rumor has it, she has a "friend" up there. Kerstin goes to school there & loves Toronto. Last Fri. Barb & I left at 10 AM for Erie & we ate lunch, first of all at the Olive Garden. it's on the right hand side of the road & that is why we ate first. We enjoyed it. Then to shopping & we did pretty good. Got home about 4:30 pm. Sat. Barb started wrapping gifts & she will send her own box separately. It is filled up & I'm not finished shopping. I'll let you know when to watch for it. Yesterday we went to our Mall & found a few more things. At KMart I got a 36" imitation tree with lights. I've always wanted one for the dining room window seat & now I have it. It has white lights. Don't know if you remember where the telephone was in the basement. Dale moved it to beside the window at the foot of the stairs. Reason -- he's putting up some shelves for more storage. Dale admits he is a pack rat. I'm trying to get him to go thru his closet & get rid of some of the clothes he can't wear anymore. He's decided he needs a 33 or 34 waist for pants. Can't tuck his shirt in comfortably. I'm watching the Steelers at Cleveland & Cleveland is ahead. They are a much improved team. Also watched a little of New England vs. Buffalo. Buff. tries but doesn't do too well. Your bedroom sounds nice. I can visualize the arrangements. I like to rearrange furniture but it's hard in my bedroom & in the living room because of the fireplace & TV arrangement. So I have to be satisfied. Anyway it's too heavy for me to move furniture now. My eyes started to close so I took a little nap. Lar has been over here. He plowed (not really but can't think of the word -- here it comes, rototilled) the leaves into the garden & replaced a small tree that died, by the D.R. side of the house. It's been in the 30s all day but now the sun is out & I can see blue sky. Still can't find the "curl" book by Landvik but found another new author Elizabeth Lowell & the 3rd book of a trilogy "Pearl Cove". Very good but I would find the4 3rd book first. Was in a hurry so didn't check inside. 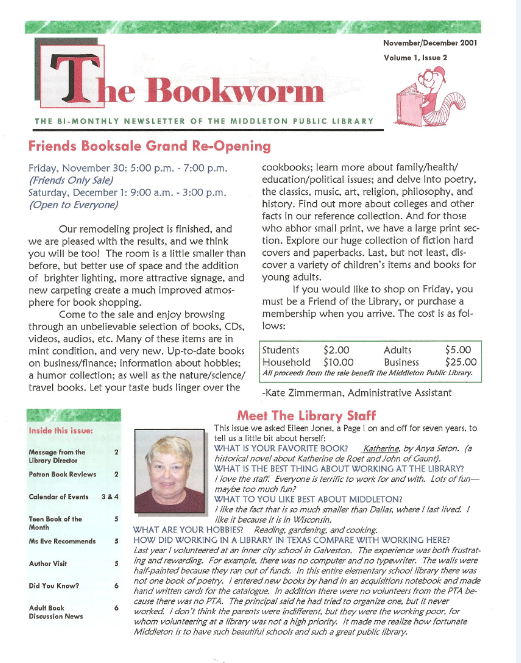 Read every word of your library "The Bookworm". Very interesting. We ate at 5 pm. Lar called & asked if he could bring Torey over while they went to dinner at Mike B's house. Naturally the answer was y es. Tor is here. I finished cleaning up, poured a cup of coffee & went into the L.R. AS I went thru the D.R., I saw what I tho't was a kleenex I had dropped. It wasn't. Fri. nit3e Tor bit the stitches out of his tail. So for the 3rd time the vet fixed it again. So that is why Tor is here -- they're afraid he'll do something to his tail again. And he had removed the bandage. I didn't know what to use, so I covered it with kleenex & Dale taped it with duct tape. I told him he was a bag boy & to leave his tail alone. I'm keeping my eye on him & he has been good. No school tomorrow but a visitation for parents to see teachers. Lar goes to the Y for soccer so Tor will come over again. 11/13. Now it's Tues. A.M. & I'm having a coffee break. Yesterday Barb didn't have to take care of Scott, so we went to Jamestown & got more shopping done. I'm not wrapping gifts yet. Last Sun. I got my Christmas cards addressed. The hard part is coming -- writing notes on many of them. 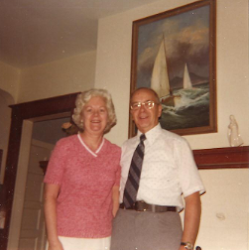 I was glad we were able to go to J.town as next Fri. Barb works for Barb Jacobs (she was here at Thanksgiving one time when you were here), next weekend will be the or one of the busiest Fri, & the 30th is lunch with Benson's, Hollertzs, etc. Shults Auto group has a newsletter "Auto Group Scoop" & they list the worker's anniversaries (yrs worked) & Dale's is enclosed in a little box. The 21 is written but I didn't have time, I mean room! Another beautiful day. Tomorrow I have to have a blood test. Showers are forecast but not til later in the aft. Even the leaves are down from the try (I'm listening to "Murder She Wrote") tree out front. Guess I've covered all the news for now.